The ninth-seeded Huskies face No. 8 seed Utah State in the NCAA tourney Friday in Columbus. The Aggies are favored — for good reasons. 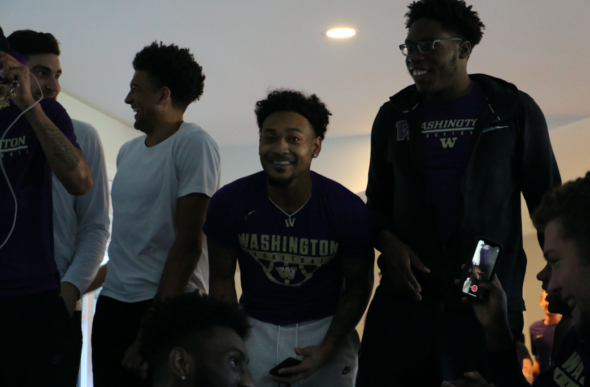 Two ways to look at the University of Washington’s first appearance in the NCAA men’s basketball tournament since the simpler days, back when the FBI wasn’t the the principal force in college basketball. 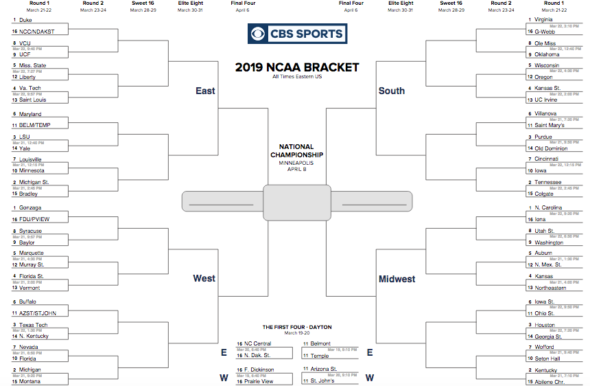 From 30,000 feet: Sunday’s selection marks an astonishing accomplishment, given that two years ago, following a 9-22 season and the firing of coach Lorenzo Romar, the program looked as bleak as Australia’s Outback in The Road Warrior. From the ground: Ummm . . . The Huskies were embarrassed twice in two weeks by the Oregon Ducks, including Saturday’s dismal second half in the Pac-12 Conference championship. Bad as was the 6-for-27 shooting in the final 20 minutes, conference coach of the year Mike Hopkins gagged a bit on another aspect of the 68-48 loss. If the ninth-seeded Huskies (26-8), kings of the mediocre West, can’t kick up some gravel with their zone defense, the trip to Columbus to play No. 8 Utah State (28-6) in the first round of the Midwest regional Friday (3:50 p.m., TNT), will be largely ceremonial. And since the game’s winner likely gets No. 1 North Carolina Sunday, the shot for a dose of March Madness will have to come Friday. Hopkins tried valiantly to talk around the loss and talk up the enthusiasm for the selection. He knows the Huskies played their best ball at mid-season, and are on a fade, going 4-3 over the past seven games as opponents figured ways to beat the zone. “At the end of the season, you want to be playing your best basketball,” he said. “We stumbled a few times, but our style is a great tournament style. Just as Yosemite Sam always seemed to have a chance against Bugs Bunny. Speaking of Yosemite Sam, a little of his passion might be useful for Washington. The Huskies have lost some edge since clinching the regular-season title early. It’s hard to even think about a team gone from the NCAA field since 2011 being smug, especially for the four seniors who stayed through the collapse and renaissance. But who knows the hearts and minds of 21-year-olds? David Crisp, one of the honored four, is ringing up no-sale on that possibility. “I can’t tell you how much this means to me,” he said on the teleconference. “It’s the best show in the world. It may be that the tourney seeding and general scorn accorded the Huskies’ finish will re-ignite the earlier fire. But in the playing of the disrespect card, they have an able rival. Operating under an obscure coach, Craig Smith, in his first year, Utah State was picked ninth in the Mountain West Conference pre-season media poll. But the Aggies of Logan won the tournament title Saturday, 64-57 over San Diego State, to get the league’s automatic entry. They have been installed by the bookies a three-point favorites, yet another volley to nethers of the Pac-12, which this season cannot look down on any league aside from the Incontinent Conference. The Pac-12 did defy the odds, getting Arizona State (play-in game) a bid as the third team following tourney champ Oregon (12th seed). There is good reason the Huskies are not favored. Utah State has won 10 in a row and 18 of its past 19. The Aggies have a 6-foot-11 freshman center from Portugal, Neemias Queta, averaging 12 points, nine rebounds and 2.4 blocks. They also have a 6-5 junior guard, Sam Merrill, from nearby Bountiful, who averages 21.2 points a game. He’s one of seven returned Mormon missionaries on the roster, which means the Aggies have an average age that’s older than, say, the roster of the Phoenix Suns. They also pay a bitter brand of defense that will probably take learnings from Oregon’s efforts that held UW to 47 and 48 points in the two recent meetings. Still, the Huskies at their best nearly beat Gonzaga, and properly humbled by late developments, stand the 8/9 seed game’s 50-50 chance. “We’ll use (the Oregon loss) as feet to the fire,” Crisp said. “Hearing our name (on the telecast) was burst of energy. From 30,000 feet, that deed seems done. Up close, however, it looks close to one-and-done. wow, what a great photo at the top of this story! they look so happy, a real reminder that after all, these are just kids. good on ya, lads. go make yourselves some memories! Cynicism aside, the big-time field has been annual part of their short lives. For hoopsters, it doesn’t get better. If the Huskies are to win even one game Hop will need to transform this team in short order. The degree of the Oregon loss was inexcusable and will require a new team to show up. It’s not inexcusable. These are kids who overachieved relative to their athleticism. But I do agree that Hop needed a better game plan vs. ORE, given the recentness of the regular-season loss. Well, let’s see here . . . they did win “even one game” and somehow the coach did not need to transform this team and find “a new team.” Not only did nothing get transformed–today was a giant dose of the previous version. Let’s see if somebody has the stones to return and admit massive error. Today’s game was a gas to watch, especially the Utah player who spent half the game crying to the refs, then getting pantsed by various Husky D facets. They got here. Congratulations, Huskies. More will be gravy on top. I love me some gravy. A reasonable outlook. But the worst part about the 8/9 game is having to play the 1 on Sunday. Still, gravy be gravy . . . I always figured getting an 8 or 9 seed was punishment for some dastardly deed, unrealized or not. For the Huskies, I supposed that dastardly deed is the disappearance of anything resembling an offense the last part of the season. Go Zags! Nothing like having a national championship caliber team in your own backyard, so to speak, with scant coverage from the west side press. That’s either complete disdain for anything east of the cascades in this state or utter myopathy or both. Hello, SPORTSPRESSNW, does the NW stand for northwest and is Gonzaga located in the northwest! I get the Huskies coverage but how about throwing a bone to the real dawgs in this state! Well, we did cover the WCC title-game loss with Doug Drowley on-site. But the expense of a potential three-week run in the tourney is a budget-crusher. Unless you, dear DonMac, want to subsidize to the tune of $5,000-$6,000? Well Art, if you construe my comment about at least some mention of GU being a one seed to mean wall-to-wall coverage of GU then that’s bit of a stretch, Dear Art. It’s evident from your comments that you could care less about covering the east side of the state so I’ll do you the courtesy of holding my comments on the subject. Go Huskies! Hey, I made the trek to Pullman for the Apple Cup. And I may sign up for Mike Leach’s class on war and the spread offense. So that’s where Sideline Smitty ended up ….. He is there with Jim Ratt. I was going to make a joke there myself, I thought it was too insider-ish. But it’s fine in the comments. Including husky73 with Jim Ratt. Great seeing the real Dawgs get into the tournament fairly easily. Not an easy path but hopefully a stepping stone to many invites in the future. Hopkins figures to be a player nationally for as long as Syracuse doesn’t summon him. Kind of feel like they’re playing with house money at this point considering, as you pointed out, where they were a couple years ago. That said, it’s frustrating that they aren’t playing to their potential. Their offense hasn’t looked right since the Utah/Colorado home stand about a month ago. I’d love to see them in their mid-season form against UNC. However, if they don’t get back to that form, they’re not beating Utah State. Aside, I would not be pleased being a five seed looking at a relatively healthy Oregon as a twelve. I would not be surprised to see Oregon destroy Wisconsin. It’s a shame to have come this far on the hike, then fall over a rotted log. Well, my Anteaters (“Give ’em the tongue/Give ’em the tongue/Zot!/Zot!”) have made it in and might even win a game or two. I love talking about UCI because they were on ESPN quite often and I grew to love them. Who is this “Huskies” team you talk about, Art? UConn? Northern Illinois? Northeastern? I don’t think they’re in the field, are they? And I don’t know any other “Huskies” team that was on TV, do you? Or is this a good question for Larry Scott? Every tourney needs a darling. As long as you tell me you didn’t bribe someone to get you into Zotville, I’ll fall in. How did the UCI football team do this year? Undefeated again? You mentioned Northeastern, they were beat by Kansas today. Do some research before shooting your mouth off. Carry on…. Agree that the view from 30,000 feet is the more relevant. Hopkins excelled with what he had inherited. The trajectory is for better days ahead. When defenses figured out how to keep Dickerson away from the rim, the entire offense unravelled. Surely that was to be expected. But what about the view from 100,000 feet? Can the PAC-12 keep its talented young coaches (Altman, Hopkins, Hurley) from jumping ship? Their roots all lie further east. And it’s not clear that the PAC-12 tailspin has played out. The feds may shut down the Arizona empire, and once mighty UCLA has lost its way — now more a graveyard for aspiring coaches than a desirable destination. What quality candidate will want that job? I think Altman is in it for the long haul, Oregon has and will pay to keep him. Hopkins will stick around as long as Boeheim is at Syracuse, and even then, if he has things humming at UW, might choose the nicer city with the forgiving fans in the easier conference. Unlike in football, there’s some benefit to being in a bad conference (Mark Few). He grew up on the west coast after all. Arizona has the number one rated class coming in next year, and I think the risk of the feds is overblown, if Miller was at risk, he’d probably already be gone. UCLA is still UCLA. If you’re an upcoming coach in a small midwest town with brutal winters, unless you’re the type that likes that, being a millionaire living in Westwood right next to Malibu, with SoCal as a recruiting base, coaching at John Wooden’s school still has tremendous upside and draw. Of everything you mentioned, I think Hurley bailing on ASU for greener pastures is the most likely. However, don’t take this as me being bullish on the Pac-12. As long as Larry is pulling his grift and the schools fall behind in the revenue arms race, it will continue its descent toward being a mid-major.